As I sit in the library and write this post, I can’t but be amazed by all of the free books. I am surrounded by hundreds of book, all of which I can check out and read at no cost. In today’s world, the library is very unique. I can’t think of too many places where you can take home hours of entertainment for free. I guess you can say the same about YouTube but even there you have to watch ads. My mom is a teacher and she is constantly checking out books. Because she has so many checked out at one time, she often forgets to return them on time. When I was younger I used to think that my mom’s overdue fees singly handedly kept the library in business. Looking at all the books makes me wonder when the first library started. Was there some president who was a real bookworm that came along and decided that everyone needed to read more? If so, I’m guessing it was James Polk. He kind of looks like a bookworm, doesn’t it? Turns out libraries have been around since long before James Polk. Like hundreds of years before JP. Wikipedia says that the first libraries open to the public were a collection of Greek and Latin scrolls which were available in many buildings in the Roman Empire. Why did I just assume that libraries were an American invention? Didn’t I realize that people were reading long before Christopher Columbus sailed the ocean blue? There is some conflict over what was the first public library in the United States. Some claim that Boston’s library was the first in 1636, while others argue that Charleston’s St Philip’s Church was the first and was started in 1698. 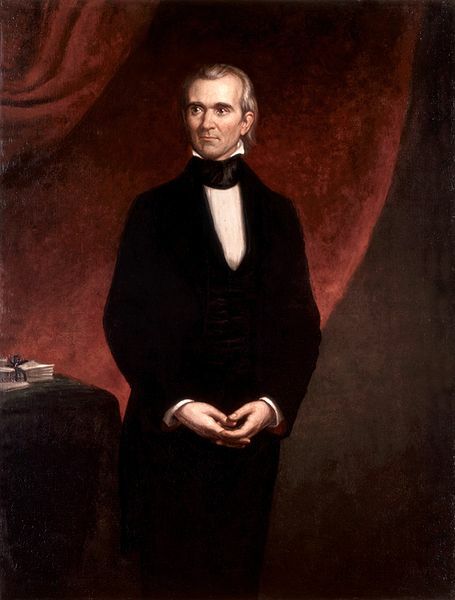 Whichever was first, it is pretty clear that James Polk had nothing to do with it. So there you have it, libraries have been around forever. I just wonder how they survived before my mom was around to pay late fees. Maybe I have an ancient Roman relative who also couldn’t remember to return their books.